The university students continue their mobilizations across Greece against the closure of faculties planned by the Greek government. 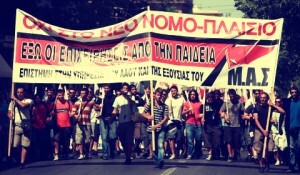 With the initiative of the Students’ Front of Struggle (MAS), a students’ organization allied with PAME, large demonstrations are being held every day in all big cities of Greece, Athens, Thessaloniki, Patra, Larissa etc. Today they are holding an all-day blockade of the Ministry of Education. This entry was posted in news and tagged Greece on March 14, 2013 by wftufise. This entry was posted in news and tagged Greece on March 13, 2013 by wftufise. This entry was posted in news on March 10, 2013 by wftufise. Haji Muhammad saeed A|rian Founder/ Secretray General Pakistan Labour Federation (PLF) paid great tribute to the Comrade Khalid Abdul Ghani Khreisheh on his meritorious services for the rights of the palistanian workers and said that his struggle and services for the protection of the workers rights will be rembered in the history of Trade Unions of Palistine.He said that Comrade.Khalid Abdul Ghani death is a great loss to the movement of Labour and Trade Union of Palestinian. He said that Pakistan Labour Federatrion has send a message of condolance to the Faimily of Comrade Khalid Ghani Khreisheh.